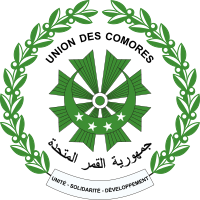 The naitional seal o the Comoros haes the crescent foond on the naitional banner in the center; athin this crescent are the fower starns foond on the banner. A sun wi rays extendit is richt abuin the crescent. Aroond the focal pynt, the umwhile name o the naition (Federal Islamic Republic o Comoros) is written in baith French an Arabic. The border is componed o twa olive branches, wi the naitional motto at the bottom in French. Wikimedia Commons haes media relatit tae Coats of arms of Comoros. This page wis last eeditit on 30 August 2018, at 14:02.